Running while pregnant has been proven to be a good for both you and your baby’s health. Whether or not you were an athlete before you got pregnant or havent worked out before, it is always the time to start an exercise routine. I ran through 39 weeks of pregnancy, some days were easier than others, but with all the changes that my body went through, exercise was the one thing that helped me feel normal. Every month I ran slower than the month before. Every day I woke up exhausted from pregnancy insomnia, but I laced up my shoes and got moving first thing in the morning, no excuses. 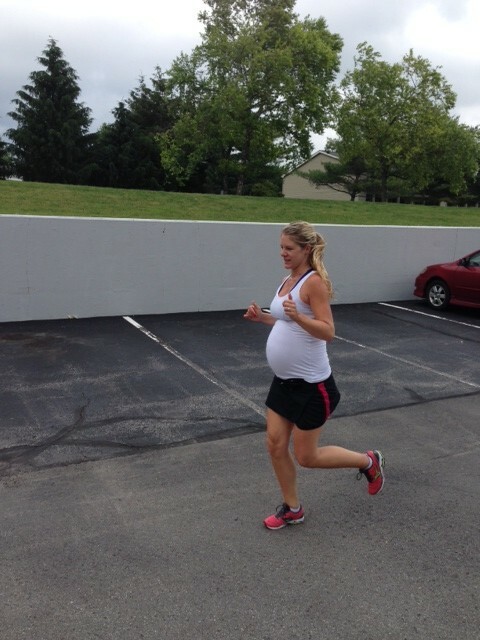 Here are my 8 best tips for running throughout your pregnancy! If you know you want to get pregnant in 3 – 6 months start your exercise routine NOW. I start working with women up to a year before they get pregnant so that they can build a base line fitness level to continue throughout their pregnancies. If you are reading this already pregnant… start NOW. Don’t let yourself use the excuse “I’m not in good enough shape” or “I should have started 9 months ago”. Start with walking every day. Build 20 minutes a day up to 45+ minutes a day. If you want to try jogging, see how your body responds. Don’t be afraid to sweat, it’s good for your body! Notice that I didn’t say – commit to your strength, or personal best, or weight management. I said your HEALTH… and your babies health! This is the hardest one and most important concept to grasp. In the last few months of your pregnancy you get tired and mentally exhausted from carrying around an extra bowling ball with you everywhere you go, but if you commit early on to moving every day and getting your heart pumping you and your baby will both benefit. Don’t try to lose weight or beat your records in strength or running time, focus on moving and feeling good during your pregnancy. If you say “I’m going to stop working out at 37 weeks”, you will. Once you get lazy your body will stay lazy. If you take a week off from exercise, it will be harder to get back into a routine. Unless your doctor is telling to slow down, keep going. Listen to your body and don’t overdo it, but if you don’t have the energy to run, walk. If you don’t feel that your body can handle a strength routine, do yoga. But keep moving. Keep moving and commit to your health as I mentioned above, but always listen what your body is saying and talk to your doctor. If you don’t feel good about a certain exercise, stop doing it. For example, early in my pregnancy I felt weird about doing jumping jacks. It was a complete mental thing, for some reason i could run 3+ miles a day, but jumping jacks didn’t feel right. So I didn’t do them. Listen to what your body is telling you to do and not do. Ask your doctor questions and if they don’t have a good answer email me (or email me anyways!). If you have aches, pains or worries talk to them. No question is a dumb questions and sometimes you just need reassurance to keep moving. Seriously these saved my ankles later in pregnancy. They are expensive, usually $50 per pair, but by 8 months my ankles were major swelling and compression socks did miracles. I put them on when I woke up in the morning before my run and if I was up on my feet a lot during the day, I would keep them on all day. Don’t just grab a sip of water before you leave for a run, bring a full water bottle with you and drink another one when you are done. Especially in the heat, your pregnant body needs copious amounts of water during the day, and the last thing you want is for you to become dehydrated which is dangerous for you and babe. Don’t run every day. Run one day, go on a long walk the next and spend the third day strength training. Don’t forget to stretch your muscles and work in a yoga routine or two during the week. Your body is going through a lot of changes and in order to strengthen it you need to give it a little bit of everything. These are tips that helped me keep running through my pregnancy – what is your best suggestion to stay active for the 9 months?